This scene must have been difficult to film. 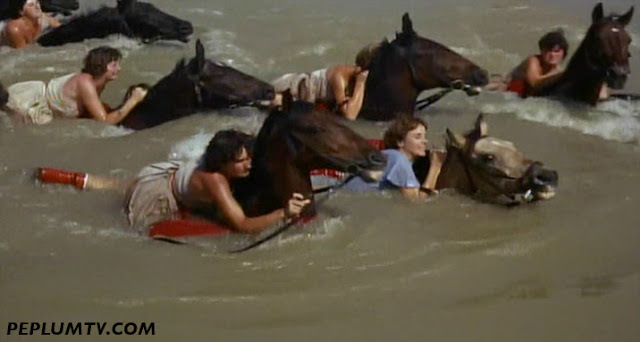 20 or so horses and women riding them through muddy waters. This is one of the best scenes in this interesting misfire. IMO, it's a misfire because of the casting. The leads, Syms and Louis Jourdan, are somewhat okay but they have no chemistry. And Jourdan as a barbarian is a stretch. The supporting cast is much more interesting even if there are a few actors amongst them that are annoying, such as Nicole Courcel who's over-the-top. The film is on Youtube for those who haven't seen it. This is a fun Peplum flick; Sylvia Syms is very cute. However, I agree fully that Louis Jourdan was seriously miscast. Okay film. Just nothing to write home about.